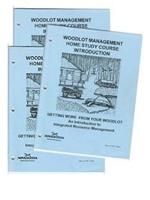 "Have you ever wondered how to grow more wood, improve wildlife habitat on your woodlot or maintiain and safely operate your chainsaw?" Decide which module to study and proceed at your own pace. In some regions department staff may conduct field days to support the material. You may select from any of the active modules on the right. Modules are being added as they become available online. If the module you wish to study is not available online contact us and we will send one out by mail. Online modules can also be be obtained through the mail or downloaded from this site. We Need Your Input ! Completion certificates for each module are now available to registered particpants who make 70 % or better on the quizzes or completed workbooks.